For the Microsoft Dynamics NAV database upgrade, you use the data conversion tools provided with Microsoft Dynamics NAV 2013 to convert the existing data with the old version’s table and field structure, so that it functions together with the new version’s table and field structure. Only table objects and table data are modified by the data conversion tools. All other objects including pages, reports, codeunits, and XMLports are upgraded as part of the customization merge process. New customized pages, reports, codeunits, and XMLports are imported during data conversion, which is step 2 in the following example. For more information, see Task 11: Step 2 Data Conversion. 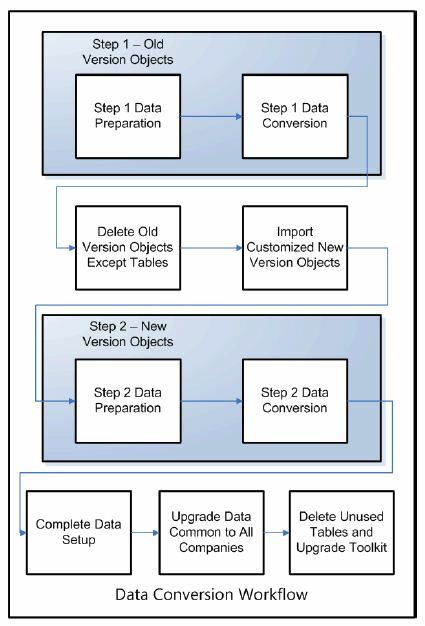 The data conversion process is outlined in the following illustration. Step 1 covers tasks that involve the existing data in the old version objects. You perform Step 1 tasks using the Microsoft Dynamics NAV 2009 version of the Microsoft Dynamics NAV Development Environment, which is the component that was known as the Classic client in Microsoft Dynamics NAV 2009. You can use either the Microsoft Dynamics NAV SP1 or Microsoft Dynamics NAV R2 version of the client. Step 2 covers tasks that involve changes to the existing data with the new version objects. You perform Step 2 tasks using the Microsoft Dynamics NAV Development Environment.